The Island of Gorée is known as a former center of the Atlantic slave trade from where many Black slaves were deported to the Americas. The island of Gorée was one of the first places in Africa to be settled by Europeans, the Portuguese setting foot on the island in 1444. Gorée was principally a trading post, administratively attached to Saint-Louis, capital of the Colony of Senegal. Apart from slaves, beeswax, hides and grain were also traded. The population of the island fluctuated according to circumstances, from a few hundred free Africans and Creoles to about 1,500. I spent several days in Dakar in June 2018. On my first morning, I caught an early ferry to Île de Gorée, which, at least according to UNESCO, was the largest slave-trading center on the African coast from the 15th century to abolition in the 19th century. Although many historians disagree with that assessment, Île de Gorée has become an essential stop for the African diaspora, including President and Mrs. Obama, who visited the Maison des Esclaves and its windowless cells and “door of no return” in 2013. I also visited the slave house, even though academics have generally agreed since the 1990s that the house was more likely to have been a private home than to have been involved in the slave trade. Whether or not Île de Gorée played an important role in the transatlantic slave trade, the small island has become a moving place to contemplate the human toll of African slavery. 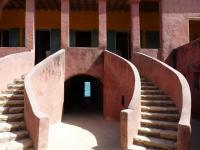 Goree is a small pleasant island situated a 30minute ferry ride offshore from crowded ugly Dakar. Free of vehicles, its sandy streets are lined with pleasing old houses and flowering shrubs. There is a fort, a castle (with some impressive early 20th century gun emplacements) and several restaurants – in its own right it deserves a visit if you are in Senegal. BUT – beyond these anodyne aspects, lies its claimed “history” as a centre of the Atlantic slave trade and its subsequent emergence as “a memorial to the African diaspora (which) continues to serve as a reminder of human exploitation and as a sanctuary for reconciliation.” (UNESCO long description). 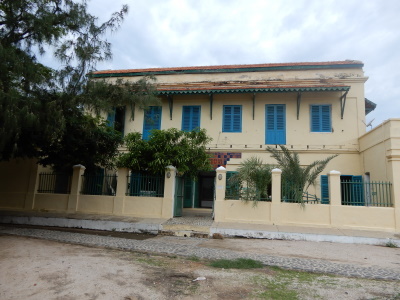 The central point for this “memorial” is the “Maison des esclaves” (photo). Within you will be shown what are said to be slave prison rooms and the “gate of no return” through which slaves were sent to the Americas. You will be regaled with details of the undoubted horrors of the slave trade. You will be shown plaques commemorating the visits of numerous world leaders – a visit is de rigeur for any such person visiting Senegal – Mandela, the Clintons, George W Bush and Pope John Paul II among them. 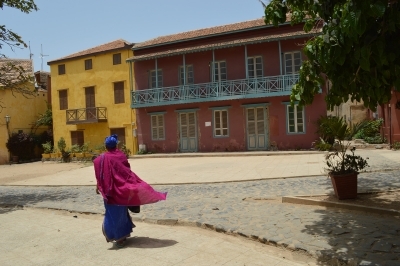 However, whether this building was ever a slave trading prison and, indeed, whether Goree itself was ever a significant entrepot of the trade is a matter of considerable doubt. But beware - to question any of this is regarded by some as the equivalent of being a holocaust denier! It is amazing that UNESCO should carry such unsupportable statements on its Web site – the inscription of Goree dates right back to 1978 and there is no objectively assessed nomination file or AB evaluation on file. However all the facts about the Atlantic slave trade and its geographic spread over time from Senegal round to Angola involving a number of European states, together with the likely maximum and minimum numbers involved indicate that such a number could certainly NOT have passed through Goree – or in all likelihood even from all the other locations involved! And indeed the Maison des esclaves looks far more like an example of the “elegant house” than of a “prison” – especially if you ignore the modern iron bars! Anyone interested in researching the subject can find plenty of material on the history of the house, its development into a museum and tourist site and its elevation as a powerful symbol disassociated from its real history. I personally disliked being “manipulated” by all this ersatz “cod history” and Goree has joined my list of similarly tendentiously presented sites (e.g Genbaku Dome). But factual truth is not the issue here – Goree has become a shrine and to question its historical “details” is as pointless as going to Lourdes and questioning the reality of miracles. The interest lies more in its contemporary role as a cultural icon – for the Black Diaspora, for Black Africa and for “guilt ridden” Europeans and Americans. If you want to see a site whose physical connection to the Atlantic slave trade is undoubtedly significant and genuine go to some of the “Gold Coast Forts and Castles”. Their presentation of the historical background also contains its propagandist aspects – but, at least, the sites' historic credentials are genuine. Islands threatened by inundation: There have been numerous WHC "decisions" over the years concerning the unchecked and continuing erosion of Goree including this in 2009 "(The WHC) ... Expresses strong concern about the ongoing erosion of the coastline, particularly in the western part of the island, and its effect on the Relais de l'Espadon and other buildings in the area;"
Bombarded by the British Navy: the Royal Navy under Admiral Augustus Keppel bombarded the French-occupied fortress on the island and then captured it in December 1758 during the Seven Years War. Offshore of a major city: Situated in the Atlantic Ocean around 3 kms From Dakar. Ferry journey from main port - near Railway Station. British Military victories over France: Captured in December 1758 by Admiral Augustus Keppel . The island was occupied by the British until 1763 when it was returned under the terms of the Treaty of Paris. Located in a Capital City: Part of the city of Dakar, Capital of Senegal. Built or owned by Dutch: 1588 - The Dutch chose the island of Gorée to be one of their slave ports. 1659 - The French established themselves on the Island of San Luis, at the mouth of the Senegal River. 1677 - The French seized Gorée. A year later the Treaty of Nijmegen confirmed the conquest.